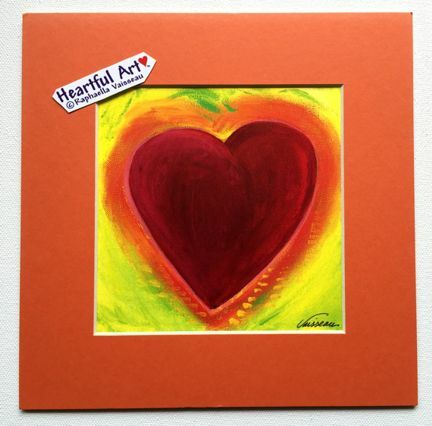 8x8 Print of "Heart of Venezuela" by Raphaella Vaisseau. This heart was painted in celebration of a dear friend of mine from Venezuela. It's full of vibrancy, fiery hot, and colorful, with orange, tangerine, blood red, lemon yellow, and a hint of lime. The original painting was acrylic on canvas, painted in Sausalito, California. Celebrate Latin energy and life. Send Love to everyone in Venezuela. Send Light to the people, animals, and the land. Envision peace and prosperity for all.